Onwuemeodo’s Tantrums Against Charlvon; Another Media Misfit Rants. Posted by admin on Nov 28th, 2018 and filed under AgwodInuju. You can follow any responses to this entry through the RSS 2.0. Both comments and pings are currently closed. I don’t think I have set my eyes on Charles Amadi, a Chieftaincy title holder, in the past six years or have the privileges of a chance meeting with the seasoned politician from Ikeduru extraction of Imo State, who is a chieftain of the All Progressive Congress, APC. Having not also been part of his state and federal constituency outreach since I am not from his area or Senatorial zone, the chance to witness his political machinations and obtain an interface for affinity to enable me author a commentary in connection to his personality is remote. But a recent vicious attack launched at the person of Charles Amadi, popularly known as Charlvon in the political sphere, by the Chief Press Secretary, CPS, to the Imo State Governor and my friend, Sam Onwuemedo, in his recent piece circulated in the news media warranted my intake into tissues of indecorous remarks made about the political playmaker who had been part of the Rescue Mission government of Governor Rochas Okorocha, before charting another course ahead 2019. Ordinarily, I have no intention reacting to the regular make-believe theatrics of Onwuemedo, he regularly dishes out in several media related forum in the inglorious course of massaging the ego of his paymasters as well as shooting beyond the limits of his official rules of engagements as the media aide of the Governor. In recent past, I have been forced to respond to several tirades Onwuemedo flung at my medium indirectly targeted at me. Part of my highlights in the responses I fired back had been an unfettered exposure of his paucity of knowledge of media relations practice having being operating like staunch media misfit unwilling to embrace the tactical finesse necessary for the job. Unfortunately, instead of adopting best practices expected of one holding such strategic position in a government set up, Onwuemedo continues to suffer from paranoia if his fatuous essay over Chalvon’s reported dumping of his paymasters’ Rescue Mission political structure is considered. In his usual style of spurning decency while addressing respected political figures in the state who do not agree with his Principal over issues related to 2019 Elections, Chalvon became Onwuemedo’s latest victim. Only recently, the Deputy Governor of the State, Eze Madumere, has been suffering bashes from the governor’s media aide. Madumere’s offence is his desire to take a different path from what Okorocha planned about his would be successor for 2019. But adequate replies from the media unit of the Deputy Governor has not only made a mincemeat of the governor’s spokesman, but further unmask his style as quackery to image management and nothing less than a distasteful departure from the real tactical know-how in public relations management needful for the office of the governor. An erstwhile ally of Okorocha and former Secretary to the State Government, Jude Ejiogu, instrumental to Onuwemeodo’s appointment in 2013 also had dosage of unprintable names he fired at him while another former office holder in Okorocha’s cabinet, the immediate past scribe of the state, George Eche, was not spared by the governor’s aide. In the past few months, Okorocha’s spokesman has devoted pages that would have been meant to refurbish the dwindling political fortunes of his paymaster, to the making of scathing remarks about ex Rescue Missionaries no longer on same page for next election. Onwuemedo has unfortunately tried to balloon the bogus braggadocio of his acclaimed writing skills into a blackmailing bombshell to besmirch former appointees and political associates of his paymasters who have chosen a different path for the 2019. While I hold no brief for anyone receiving the ugly side of his lethal pen, I am tempted to ask “What are Chalvon’s offences to warrant Onwuemedo’s undesirable venoms? After going through the media aide very invidious sting on Chalvon, few pertinent issues were raised, though imbued in facade of regret and disappointment on the part of his paymasters who no doubt have lost a vital figure and resourceful personality in their fold. Since Charlvon’s background and profile is not my charge in this commentary, three issues of immense value Onwuemedo raised attract readers’ attention. I am poised to address, to once again prove that the governor’s spokesman may have been suffering from megalomania arising from grandeur of delusion. But before I continue, permit me to talk about Chalvon from a hindsight. Available information I have at my disposal has it that if discussions about personalities making politics of the state thick, the Eziama Ikeduru born business mogul cannot be exempted. Chalvon’s profile may have attracted Okorocha to consider him a prime factor in the Rescue Mission government. He had several positions and in fact was the undisputed generalismo of the Okorocha force before he decided to go his way. Based on media reports, it was not in dispute that major decisions of Okorocha’s political family were at the instance of the out of favour political leader. The likes of Onwuemedo had in previous reports raised to high heavens, Chalvon’s capacity and leadership qualities while confirming him a staunch supporter of his paymasters’ Rescue Mission administration. Onwuemedo may have been in hibernation when Okorocha reportedly submitted Chalvon’s name to the APC NWC during the debate for tenureship of the immediate past Exco of the party. While canvassing for the removal of the Hilary Eke led state Exco, reports had it that the list paraded by the governor to the party leadership for confirmation under caretaker committee chairman arrangement for Imo APC was Chalvon. 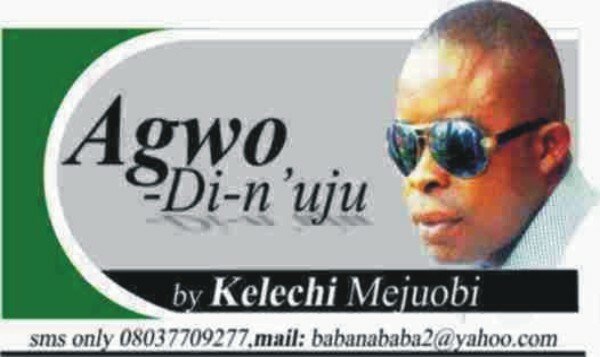 How and when he turned a betrayer and other unprintable names Onwuemedo called him after a fruitful romance with Okorocha was expected to have been a puzzle the governor’s media aide would have helped his paymasters solve quietly than dance naked in the public with an insipid write up. In 2015, am aware Chalvon joined APC after the PDP primaries. Granted, he was the progenitor of the defunct Owerri Zone Political Forum, OZOPOLF, but Onwuemedo was expected to have shaded off partisan proclivity to understand that certain deceitful confidence trick on the part of the ticket holders rubbed the shine off efforts the OZOPOLF made to carry the campaign beyond the pre 2015 election era. Information has it that the shenanigans of a group interest in the camp of one Owerri Zone major contender in 2015 election rocked the boat as the OZOPOLF outfit were alleged to have not only been disregarded in the scheme of things but not given a sense of belonging in the game plan. Based on the above analysis which I had chorused in previous articles on why a governorship of Owerri zone extraction may become a mirage, Chalvon and members of his OZOPOLF group were said to have been dischanted and opted for another platform that saw them in APC where Okorocha was the governorship candidate and later emerged the number one citizen of the state for a second time. As a loyal party man, Chalvon may have entangled himself to APC and not Okorocha as an individual since the governor is only a leader with a mandate due for expiration on May 29, 2019. Onwuemedo before wasting his ink on the tirade would have also known that Chalvon may not be part of the regular Rescue Mission cheerleaders whose stock in trade is Hero-worshiping of the governor. Onwuemedo should know the charges he raised against Chalvon is very infantile and speaks volume of his poor knowledge of relationship between a leader and party man. Chalvon’s respects party supremacy which recognizes Hope Uzodinma as the governorship candidate other than Uche Nwosu, the governor and the Rescue Mission bandwagon have been advocating as next governor. Since the party has announced Uzodinma, Guber ticket winner, Chalvon and others who believe in the supremacy of the party decision have the moral right to stick to the lineup of the ticket holder than sheepishly embark on a governorship race in another party. As a staunch APC member, does Onuwemedo and his paymaster expect Chalvon to dump the party and move into a new one because of Uche Nwosu’s ambition? Had it been he did that, Onwuemedo would have canonized him for a “job well done”. Again, will Onwuemedo and his paymasters coerce followers of their favoured candidate, Nwosu to shift to another party other than the APC when those ones are not willing to dump the ruling party? Since Chalvon has not dumped APC but only tried to identify with the party’s governorship candidate, Onwuemedo and his paymasters should stop crying foul. Onwuemedo as a strategist judging from his media job role, was expected to have advised his paymasters to embark on soul searching over the sudden misfortune in their political trajectory. It may not be apt to elude the fact that Charlvon may have dumped Uche Nwosu’s voyage on grounds of financial inducements knowing fully well that Charlvon may not have personally benefitted financially from the Rescue Mussion government. If Onwuemedo is not aware, sorry tales have been the portion of those who served the Okorocha government as they claim to be losers due to the spirit of familiocracy reigning in Rescue Mission. But in any case, this is perhaps the time Uche Nwosu will be spreading money to his supporters and fans alike, and yet Charlvon choose to turn a blind eye. Instead of visiting Charlvon with invectives, Onwuemedo would have embarked on deep thought and reflect why Adams Oshiomole who the governor had branded the “Messiah” coming to salvage APC after John Odigie-Oyegun leadership he battled to save has now been tagged the “monster” in their camp. Before hurling missiles, Onwuemedo should have concentrated on assisting his paymasters discover reasons why egg heads of Rescue Mission are gradually pulling out from the government and pitching tenth with the APC governorship candidate. It is very important for Onwuemedo to do a thorough soul search to know exactly what may have happened between the APC National Chairman on one side and Governor Rochas Okorocha and Uche Nwosu on the other side. If Charlvon had lost confidence in Uche Nwosu’s ambition which appears to have been sacrificed, what offence did he commit even when he may have told both Okorocha and Uche Nwosu of his game plan to leave?